Social media has come as a useful marketing tool for all. Be it a corporate giant or a small start-up, social media marketing is now accessible to all scales of businesses. Likewise, live streaming on social media platforms has also grown in parallel. In 2018, the engagement of Internet users with video content on social media platforms is unprecedented. If we check the Google trends, Facebook Live streaming has grown by over 330% in terms of popularity. Be it for survival or evolution, Facebook’s live stream feature aggressively inspired numerous other social media platforms to add live streaming options on their platforms. Today, all other social media streaming platforms, from Facebook to YouTube, Instagram, Twitter and Snapchat, have adopted this trend. We’re about to take a walk through some popular social media live streaming platforms. We’ll also explain how you can start streaming on these channels and what aspects you should care about while using them for social media marketing. Why should you use social media for live streaming? You do not need to invest a ridiculous amount of money for streaming live on any of the social media platforms. 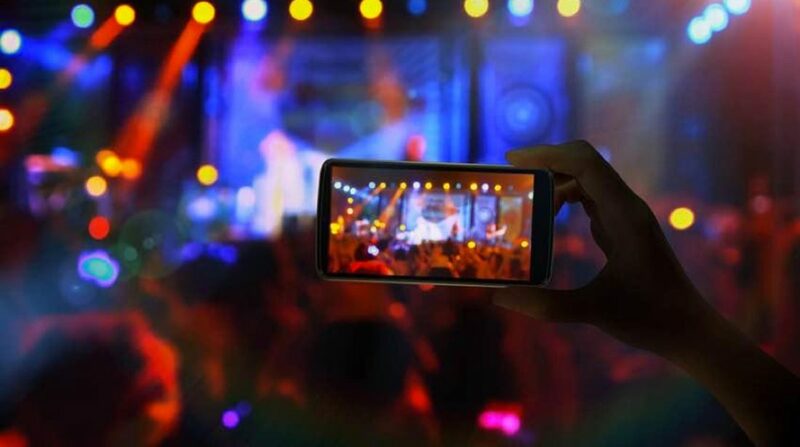 Just get a smartphone with a camera, a good internet connection and a corresponding mobile app and you are ready to start live streaming. Al most all social media applications (such as Facebook, YouTube, Instagram, Twitter, SnapChat, etc.) are free to use. However, you will have to spend a little if you want professional-grade streaming quality. For example, live streaming solutions like Ustream, StreamNow and DaCast offer advanced features for professional quality streaming. FOMO (Fear Of Missing Out) is a very real thing among current generations. Each person on social media wants to stay abreast of the latest happenings on the globe. Social media platforms, overall, get traffic from over 3 billion users per month—this is 42% of the total global population. With the audience on social media, you can leverage the present generation’s habit of staying well informed and gain traction to your live events. Live streaming in itself is a great engagement booster for video content. In addition, when live streaming happens on apps like Facebook Live and YouTube Live, they offer users an array of interactive features like live commenting, stickers, donations and sharing. Once users tune in to your stream, they can participate in discussions and debates even after the event is finished. Moreover, when streamers also interact with the audience and respond in real-time, users feel more connected to the session. If you are streaming for a brand, a simple interaction in the form of a quick Q&A or chat session can lead to spontaneous results. Live streaming is not bounded by physical boundaries. You can extend your reach beyond the boundaries of homes, cities and countries. 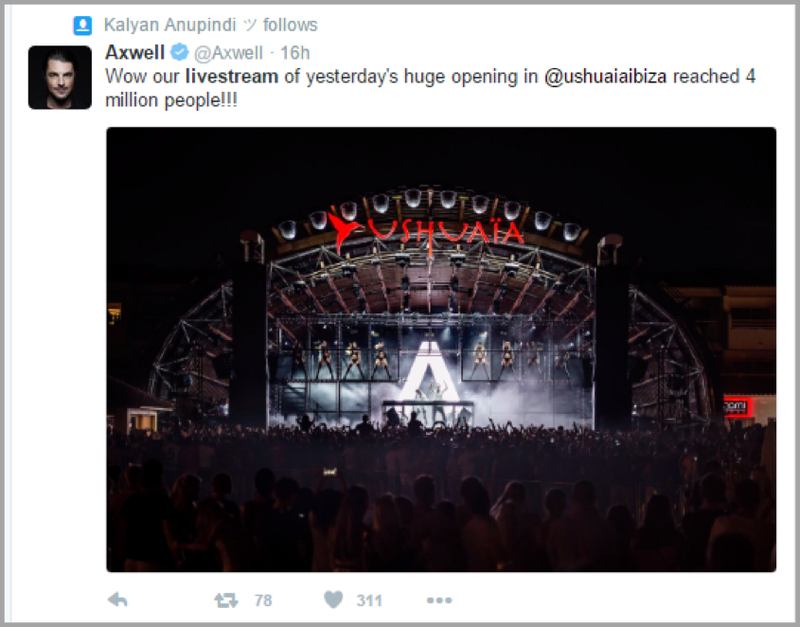 This is how DJ Axwell’s Facebook live stream for the concert was able to reach an audience of 4 million. Despite the stadium was capable of holding only 5000 people, 4 million people could watch the event because of social media streaming. Where can you start social media live streaming? 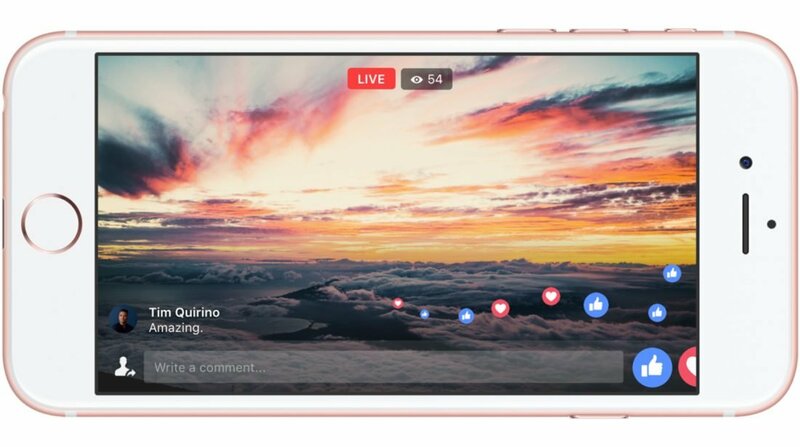 Facebook live represents a highly optimized and popular platform for personal as well as professional grade streaming. It already has a sound base of 2.23 billion active monthly users. Hence, you have a high chance of attracting a huge viewership for your live broadcast. Viewers can communicate using text, stickers, and various emojis. Streamers can tag friends and followers who they think would be interested in the stream. It also allows hashtags to make the stream highly targeted and visible. One can schedule a live stream in advance and promote it beforehand. Supports split screen streaming where you can invite other streamers to share the screen. Live streams can be saved to let the users watch even after the session is over. Earlier, businesses were using Facebook for sharing their videos after uploading them on YouTube. Nowadays, Facebook live streaming has become one of the alternatives of the same, and users are adopting the platform as a separate marketing channel in addition to YouTube. 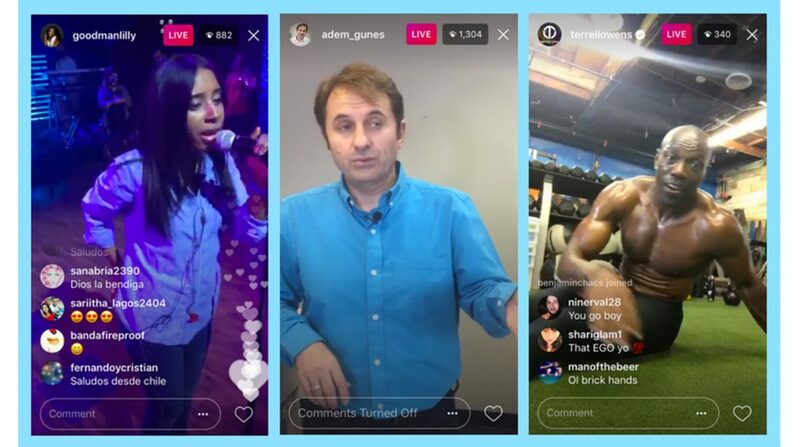 Businesses are using Facebook live streaming to broadcast a variety of topics like live concerts, Product launch events, Tutorials, Product demos, Q&A sessions, Customer support, News and Announcements and Gaming. 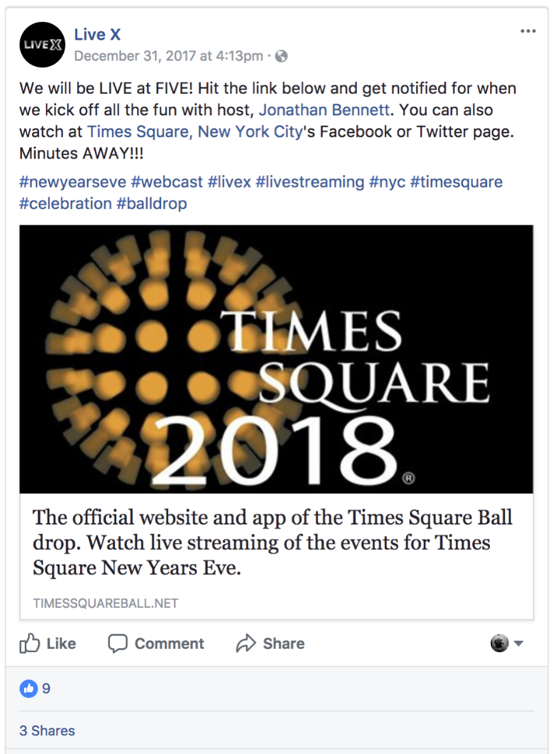 Facebook offers “Ad Breaks” as a method of making some earnings through the live streams. Here, streamers get the option to take short breaks during the stream. To use the feature, your stream should last at least for 4 minutes and 300 people should be watching it concurrently. You can take an Ad break of 15 seconds once the criteria are fulfilled. People who watch the stream after live sessions also see these Ads, letting the streamers earn from the saved streams as well. Instagram has a base of more than 700 million active monthly users, which consists of 173 million daily active users. A massive number of Facebook users are continuously adding up to this Facebook-owned platform. Your watchers can communicate with you using live chat text and emojis. You can allow or hide commenting during the live stream sessions. You can see the number of viewers watching your stream in real-time. You can hide your live videos from selected people. You can use hashtags to make your live video highly targeted and visible. You can save only the live videos, not the live session as a whole. Eg. Comments are not visible after the session is finished. Supports split screen streaming like Facebook, where you can go live with multiple streamers. Because of its bigger engagement, Instagram users are now willing to engage with brands more than any other platform. In fact, 71% of U.S. businesses have separate marketing strategies just for Instagram Live. 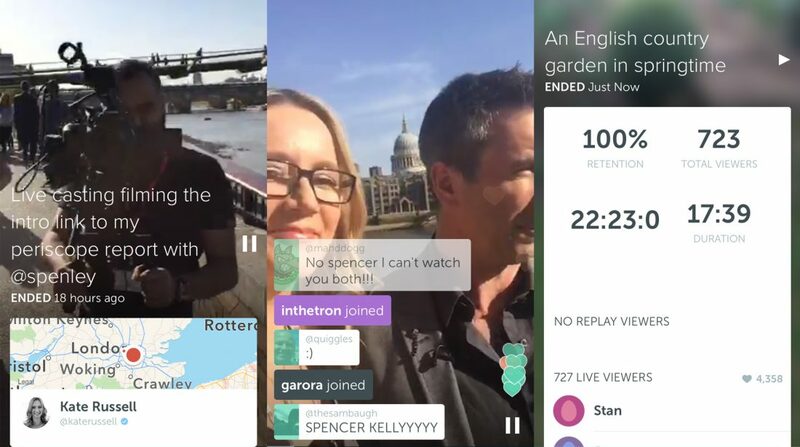 The live feature is being used across the globe for streaming on topics similar to Facebook: Brand promotion, Q&A, press conferences, celebrations, behind the scenes, tutorials and many more. Instagram live streaming does not support Ads like Facebook. However, the platform itself earns money by showing the featured Ads posted on Instagram via Facebook. Periscope is the Twitter-owned live streaming platform with more than 10 million users in total, which can be divided further into 2 million daily active users. You can integrate the Periscope app with your GoPro camera. Streamers can do live sketching during presentations. A Periscope live stream can be hosted on a Twitter page as well. It allows users to interact with streamers in real time. Users can explore the live sessions by location using the interactive map view. Unless changed in the settings, posted videos are available only for a limited time. Users are utilizing Periscope for streaming on a wide selection of professional topics like Product demonstrations, Presentations, Tutorials, Newsflashes and many more. The application itself does not generate any revenue; however, it brings users from the platform to Twitter, which is a revenue-generating platform. YouTube shares a major section of the video streaming market in 2018. It is visited by more than 1.57 billion monthly active users, which can be translated into more than 30 million daily active users. Consumers watch more than 500 million videos each day on the mobile app alone. Google shows YouTube live stream and videos in search suggestions of its SERPs. It offers automatic captioning of the video and YouTube live stream. Location tags make your videos highly visible in the relevant geo-locations. Viewers can donate to the streamers using premium membership plans. Provides unmatched ways to interact with streamers using live chat, super-chat, and custom stickers. Users can also watch the videos on demand after the stream is over. YouTube Live streaming has become an extremely popular platform for broadcasting almost any topic one can think of. From businesses to individuals, everyone is using YouTube Live for gaming, product launch broadcasts, product demonstrations, tutorials, and more topics. It is suitable for short as well as super lengthy streams. Streamers can earn through Google AdSense. It displays Ads before, in-between, or after the videos accordingly. The newly added Superchat and Premium Membership features also let the creators earn directly. Streamers can also get in touch with brands through sponsorships where they promote their products in return for compensation in cash or the like. Embracing the ability to broadcast live will aid you in getting along with the changing face of digital marketing in today’s scenarios. No matter how small or big is your business is, if you know how to broadcast, you can mark your presence in the market with greater ease. Not just for digital marketing, but you can also choose streaming as a profession and earn from what you broadcast. Here at Yum Yum Videos, we have seen people and businesses who started streaming on free platforms, and later upgraded to their own custom videos. Whenever you’re ready to take the next big step, you can contact us!